Each year, the South Carolina Association of Regional Councils (SCARC) picks a “Regional Project of the Year.” Each COG is able to nominate one project for consideration by a state-wide panel. The nominees must represent a unique or innovative project or effort, undertaken by one or more SC COG, promoting a significant positive perception of any COG, all SC COGs or in implementing the concept of regionalism. The following is an overview describing the project. A significant number of the brownfields sites in the Catawba Region are relatively large (10 acres or more) and centrally located among surrounding residential areas. These textile mills and adjoining mill villages are found in both urban and rural areas. As these former mill properties sit idle, they are quickly becoming sources of blight for their adjoining mill villages. Redevelopment opportunities are often dismissed due to the specter of contamination of soil and water on these sites. Limited state and federal programs are available to assist, but these are disconnected and often difficult for local leaders to navigate. Many of these mill sites pose serious health and safety risks due to the neglected conditions of the buildings and grounds, not to mention the potential for serious environmental issues on-site and off-site resulting from hazardous substances often found to be associated with textile mills sites. The substances include: friable asbestos, Polycyclic Aromatic Hydrocarbons (PAHs) and Volatile Organic Compounds (VOCs), lead and other heavy metals. These vacant properties could have significant cumulative public health and safety impacts and costs that include illegal dumping, increased costs for demolition and nuisance cleanups, crime, and vagrancy. Since 2006, three vacant mills in the Catawba Region have burned. These fires have placed additional financial pressure on strained local government budgets that are responsible for providing emergency services to fight fires, caring for victims and prosecuting perpetrators. Fire is a very real and destructive threat that also poses serious health risks to the surrounding communities. In South Carolina, textile mill production and employment peaked in the 1970s and declined rapidly throughout the 1980s and 1990s. The impact of global economic forces has been widespread and particularly hard-felt in the Carolina Upstate. In particular, the smallest and mostly rural communities of the Catawba Region have yet to recover fully from the loss of textile mill production and employment—even 20 or more years later. Development of this guidebook was essential for educating communities with former textile mills that once served as a major source of economic activity. Historically, most of the town’s residents benefitted from the jobs and amenities that the mill provided – houses, churches, schools, parks, etc. As we enter the second decade of the 21st Century, there is little optimism that the textile industry will return to these communities. Many have already fallen into disrepair or been stripped of valuable materials by salvage companies, leaving only piles of debris. The sheer size of the mill buildings and grounds adds to the potential for blight. To complicate the situation further, local governments are facing dire financial times due to the national recession and high rates of unemployment and home foreclosures. With these added pressures, what is to become of these properties? Catawba Regional Council of Governments has been involved in the successful redevelopment of multiple textile/brownfields projects that have leveraged federal, state and local funds. These projects produced positive changes on blighted, textile/brownfield properties. Since 2000, Catawba Regional has managed 17 textile related projects for localities in the region that were funded through state and federal agencies and funding sources, including the South Carolina Department of Commerce, Housing and Urban Development (HUD), the EPA and the South Carolina Department of Health & Environmental Control (DHEC). Local officials in South Carolina can use the techniques and resources compiled in this easy-to-read resource for addressing brownfields redevelopment options specific to textile mills. Through the support of the South Carolina Department of Commerce, Catawba Regional received Community Development Block Grant (CDBG) funding in December 2010 to prepare this Textile Mill Redevelopment Guide. The guide will provide a resource for the clean-up and redevelopment of these textile-related brownfields sites in the Catawba region and throughout the state to improve economic viability in low and moderate income areas. Catawba Regional and its consultants developed the following series of tools that can be used independently or together to help local officials leverage available financial resources to assess, cleanup and redevelop former textile mill sites throughout the region and the state. Redevelopment flowchart for redeveloping textile mill sites with South Carolina-specific policies, programs and incentives. Hypothetical case studies that detail lessons learned from comparable projects to maximize success and minimize delays. Community involvement guide to promote local participation and ensure consistency with local plans and applicable regulations. Phase I environmental site assessments of targeted properties to help jump-start redevelopment and increase the likelihood of receiving additional support. Sample documents and templates that can be easily modified for local use. Inventory of former textile mill sites in the region, including ownership and site details. Financial resources available at the local, state and federal levels. 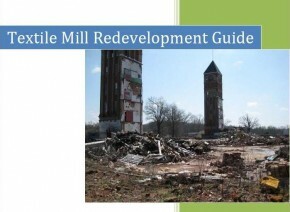 Click here to view the Textile Mill Redevelopment Guide.